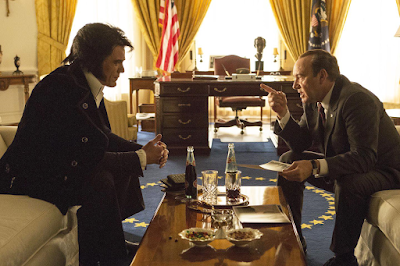 Elvis & Nixon screened at the 2016 Sydney Film Festival on Thursday June 9. For more information on the Sydney Film Festival, please see their official website. Elvis & Nixon is a highly fabricated recount of the meeting between one of the world's biggest pop stars and the President of the United States which is a whole lot of fun and embraces it's permission to be over-exaggerated and incredibly goofy. In December 1970, a meeting took place in the Oval office between then and not yet disgraced president, Richard Nixon (as portrayed by impression extraordinaire Kevin Spacey) and Elvis Presley (Michael Shannon). The photograph of the two that was taken on this occasion is the most requested in the National Archives. However, the transcript for what actually took place during that meeting does not exist so writers Joey Sagal, Halana Sagal and Cary Elwes have taken the liberty of inventing the comical turn of events leading up to and including the dramatically less than ordinary meeting between the two. Elvis & Nixon has been granted an incredible privilege which barely any other biopics receive as due to the blurry nature of the event, they are given free range with their screenplay. There are several of truths in the story as approved by Elvis' close friend, Jerry Schilling (played by Alex Pettyfer in the film), but much of the film is exaggerated for comedy value. Elvis did indeed want to obtain a badge as a Federal Agent at Large and hand-delivered a letter to the White House where he was able to meet with the President later that day, but these events are built on and enhanced comically for pure entertainment value. Elvis did not attempt to take firearms into the White House and he most definitely would not have got away with it, nor would he have shown his karate moves to or take part in a hand-slap game with the President. Everything about Elvis & Nixon is exaggerated. This exaggeration is the main source of humour, especially when it comes to the characters. Both Elvis Presley and Richard Nixon have well known and recognisable personality traits that everyone knows so these are exaggerated for comedic value, but not in a disrespectful fashion. This is particularly true of Elvis who is constantly walking around in his stage attire looking more like an Elvis impersonator rather than the man himself and always met with girls falling over themselves squealing. It is not only the characters that are exaggerated in the film, but also the production and costume design and hair and make-up. 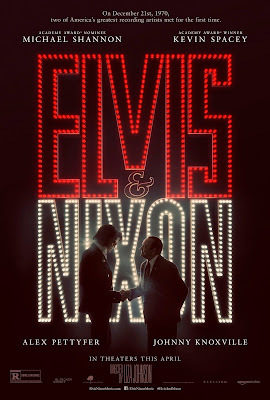 If this film was a drama or run of the mill biopic, this would be considered irritating and rather goofy, but considering Elvis & Nixon is a comedy it is all forgiven and accepted with open arms. Despite the over-exaggeration of his character, Michael Shannon gives a solid performance as Elvis Presley. While respectable, it isn't particularly heart-warming nor does it make one feel like they want to revisit any of his music or concerts in a hurry. It feels as though one tender moment where he talks to himself about his twin brother who died at birth has been just thrown in for good measure, but it occurs too late in the film to make any sort of emotional impact for the character. On the other hand, Kevin Spacey does a fine job as Richard Nixon. Spacey has an infamous knack for impressions as well as being a superb actor so it is with these two qualities that he brings Nixon back to life in a way that is both natural and humorous at the same time. Colin Hanks as presidential aide, Egil 'Bid' Krogh and Evan Peters as Dwight Chapin are also subtly amusing and solid. 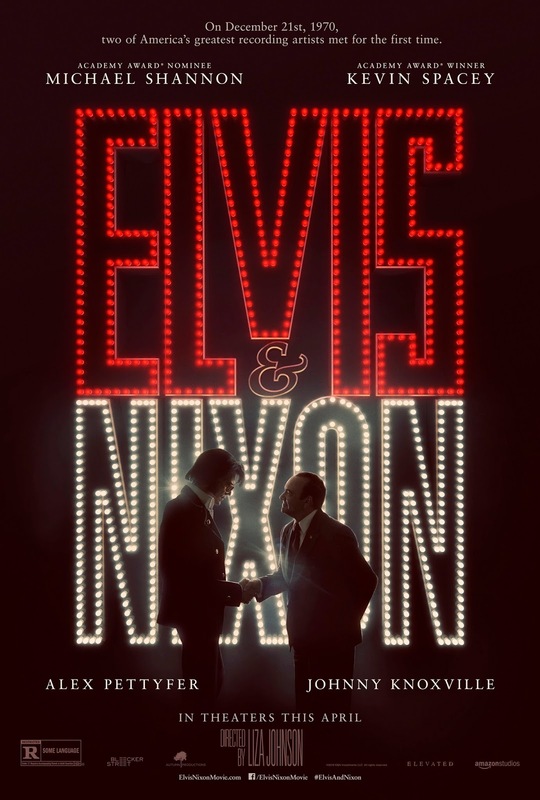 Elvis & Nixon avoids the expectations placed on movies that are based on real life events by adopting a comedic persona rather than one which is serious and dramatic and what results is a film which is fun, enjoyable and comfortable in it's exaggeration.